Members of the CFCArts Intermediate Musical Theater program invite you to their upcoming production, Disney’s Aladdin JR.! Join our 3rd-6th grade performers on a magical journey through the sands of time. All of your favorite characters from the hit Disney film – Aladdin, Jasmine, Iago, Jafar, the Genie, and more – are here in Disney’s Aladdin JR., a musical adventure filled with magic, mayhem, and flying carpet rides. 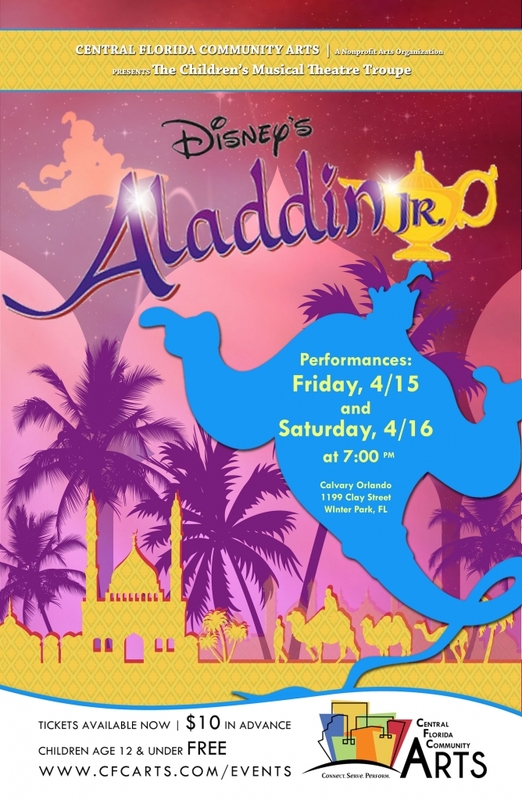 Disney’s Aladdin JR. will be held on Friday, April 15th and Saturday, April 16th at 7:00pm at Calvary Orlando, 1199 Clay St., Winter Park, 32789. General Admission tickets are $10 and age 12 and under will be admitted for free!